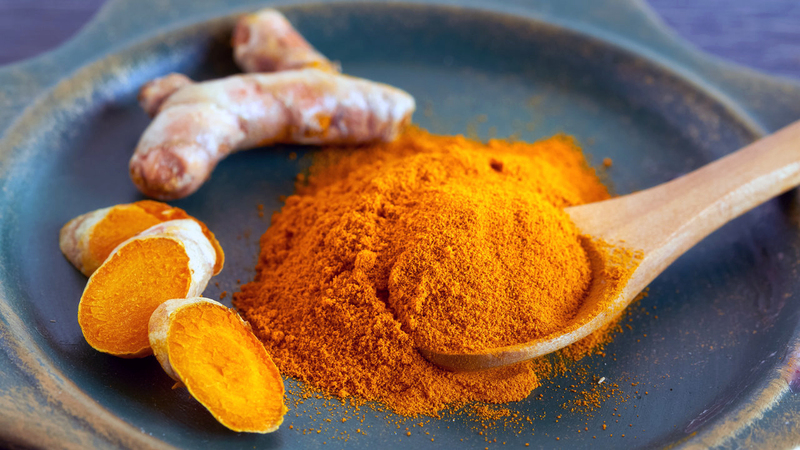 Turmeric is quickly becoming an “it” superfood. You’ve probably seen the ingredient all over Pinterest and Instagram in the form of golden-hued lattes, soups, and vegan ice cream. It was even called a “rising star” by Google Food Trends, since searches for turmeric jumped a whopping 56% between November and January. And as a nutritionist, I’m thrilled, since this healthy food trend is both delicious and backed by research. Turmeric, a root in the same family as ginger, has long been used as an anti-inflammatory compound in Chinese and Indian medicine. Its active ingredient, a yellow compound called curcumin, has been found to have antioxidant, antiviral, and anticancer properties in lab and animal studies. And although more clinical trials about the benefits of curcumin for humans are needed, it’s been linked to lower total cholesterol levels and improved liver function after liver disease or damage. I eat turmeric almost every day, and advise my clients do the same—with a few caveats. First, I do not advocate taking turmeric supplements, unless they’ve been prescribed (and will be monitored) by a physician, especially for pregnant women. I also caution my clients against going overboard with turmeric root or powder. Too much has been linked to unwanted side effects, including reflux, low blood sugar, increased bleeding risk, reduced iron absorption, and worsened gallbladder problems. To reap turmeric’s benefits, here are some simple meal and snack ideas to help you get a healthy amount of the root in your diet. Turmeric paste is a mixture of ground turmeric, extra virgin coconut oil, cinnamon, and black pepper. It’s used in golden milk lattes—those orange-yellow drinks you’ve probably seen on Instagram—which are made by dissolving the paste into warm almond or coconut milk along with a little organic honey and fresh grated ginger. And while black pepper may seem like an odd ingredient, it actually helps boost turmeric’s absorption from the digestive system into the bloodstream. Add a pinch of ground turmeric to warm water along with lemon to start you day. (Note: I’m serious about a pinch—it’s pungent, so too much can be tough to swallow.) Alternatively, you can purchase turmeric tea bags, which can be steeped alone or with other types of tea, such as green, white, black, or oolong. For a tasty and unique kick of flavor, add a bit of ground turmeric to your morning smoothie. Or opt for fresh, peeled turmeric root, which you’ll find in the produce section, likely near the ginger. A little nub no bigger than the size of your pinky nail is all you need. I love to keep ground turmeric handy to season nearly anything savory, including scrambled eggs, sautéed veggies, soups, stir frys, and pulses (especially oven roasted chickpeas). You can also fold a little turmeric into nut butter or hummus, whisk it into homemade vinaigrette, or stir it into oatmeal along with coconut milk, maple syrup, cinnamon, and nuts or sesame seeds. The options are endless! In most dishes, I’ll start with an eighth of a teaspoon and add more to taste, making sure the turmeric won’t overpower other flavors. To make homemade vegan turmeric “ice cream,” whip turmeric paste with one cup coconut milk or coconut cream, half of a ripe banana, a few pitted dates, maple syrup, and a little extra fresh ginger. Pour into BPA free pop molds, freeze, and enjoy.